In India, I have seen passengers pushing busses and cars when the vehicles break down in the mid of road. 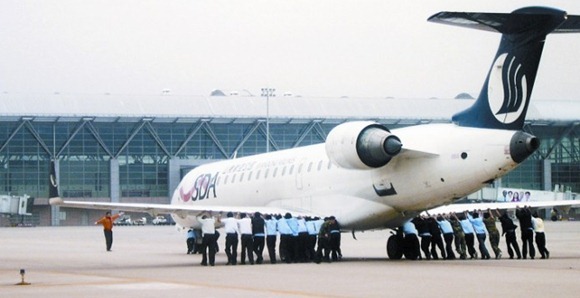 But never heard anything like this – a passenger flight in china had to be pushed half a mile by the passengers and airport authorities after landing. Chinese Shandong Airlines Flight arrived safely at Zhengzhou airport safely and broke down just before reaching the passenger terminal. The 20 ton flight was pushed by staff and few passengers half a mile to clear the run way! Don’t they have tractors or vehicles to pull aircraft. Strange..! !